Star Wars Rebels is coming! Hey, it wouldn't be Star Wars if they didn't have odd character names! Why they went with "Sabine Wren" and not, oh, "Sabine Wench" or "Zeb Oh Reallyius" or maybe "Aphrodite Syndulla" or "Agent Count Chocula" is a mystery, but, hey, that's why they get paid the big bucks! Making up those names must be hard work. I know (sees stern look) don't make fun of the Star Wars thing, this is serious business. The probably focus-grouped those names to death. Kids will be worshipping at altars to these characters in 50 years. All right, in this next clip, from special Star Wars Rebels short “Not What You Think,” Ezra finds a downed TIE fighter on the plains of Lothal. The young rebel opens the ship’s hatch -- pretending to help the ungrateful Imperial pilot -- and leaves with a few souvenirs. 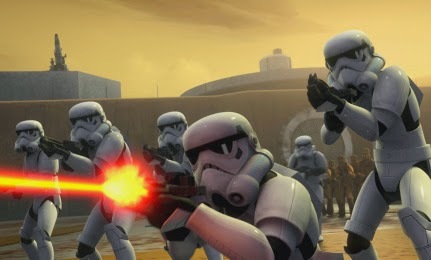 The multi-platform rollout begins September 29, when the animated one-hour movie "Star Wars Rebels: Spark Of Rebellion" will be available on WatchDisneyXD.com and the Watch Disney XD app. The global TV debut is set for Friday, October 3 at 9 PM (U.S.) on Disney Channels ahead of the Star Wars Rebels series debut Monday, October 13 at 9 PM on Disney XD. This is a global phenomenon. The series will air in 34 languages across 163 countries in over 400 million households, Disney says. The cartoon series is set five years prior to the 1977 Star Wars. The Jedi are left hiding, the dark side is dominating the scene, and the Rebel alliance as we know it from Episodes IV-VI hasn’t formed yet. But, we know it all has a happy ending - right? Well, sort of. Star Wars Rebels is created by Dave Filoni (Star Wars: The Clone Wars), Simon Kinberg (X-Men: Days Of Future Past, Sherlock Holmes), and Carrie Beck. 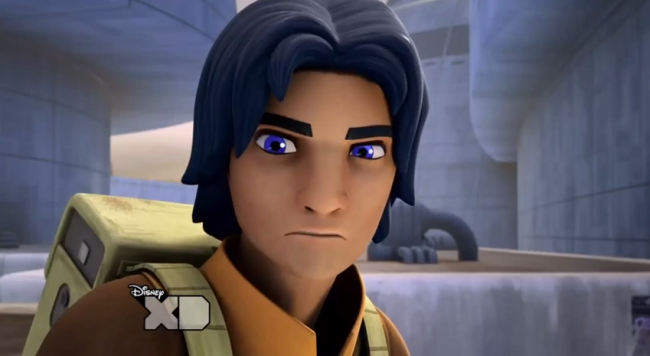 The Lucasfilm Animation production is also executive-produced by Filoni, Kinberg and Greg Weisman. Get a sneak peek at what's to come in the first season of Star Wars Rebels, including new scenes featuring the Inquisitor, Ezra's Jedi training, and the appearance of a certain droid duo.